1 Bedroom Flat For Sale in Harrow for Asking Price £295,000. Show Apartment Available To View. A newly refurbished office building development of 92 apartments by Harrow Holdings Limited sits centrally located for Harrow's Town Centre and excellent transport links via Harrow on the Hill Station. This 1-Bedroom 4th Floor apartment has a fitted Kitchen, tiled Bathroom and flooring. Perfect for First Time Buyers and young professionals, Queens House is conveniently situated for the Town Centre with its range of shops, eateries, cinema and gym. 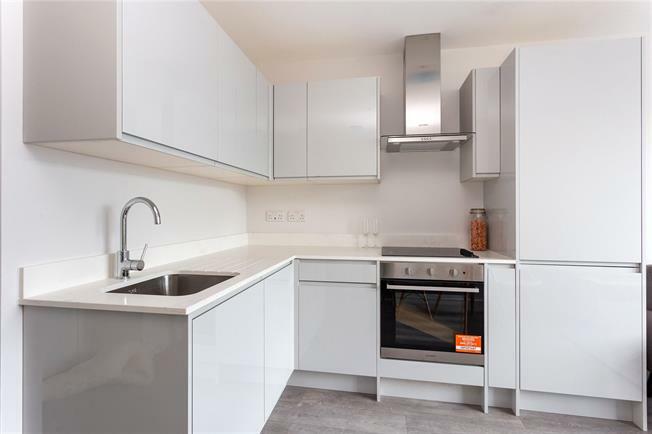 - Contemporary Kitchen with Quartz worktop and splashback, integrated appliances to include oven, hob, washing machine and fridge. - Bathroom is fully tiled with porcelain walls and floor, high gloss vanity unit with basin, wall hung wc, chrome fixtures and fittings, fixed shower head, heated towel rail. - Engineered wood flooring to Living/Dining room and Hallway. Carpet to Bedroom. Tiled Bathroom. - Lift access to all floors. - Pre-wired for Broadband and Sky. - Audio entry phone system.